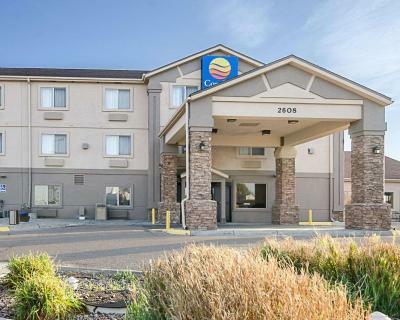 Lock in a great price for Comfort Inn Garden City – rated 8.2 by recent guests! The staff accommodated extra needs for ys. They made us feel at home. No they were sort of running one day, and dried out the next. My family was in town for baseball. We came in late and left very early. The room was clean and updated. Did not get to use the pool or even eat breakfast. Staff at this hotel, especially Jeffery, were attentive and went out of their way to make sure we had everything we needed. Beds were very comfortable. Room was very nice. Breakfast was great. The bed was comfortable. Breakfast had a good selection. The shower was easy to use. Excellent beds. Breakfast buffet was one of the best we've every had. Will be staying here again. 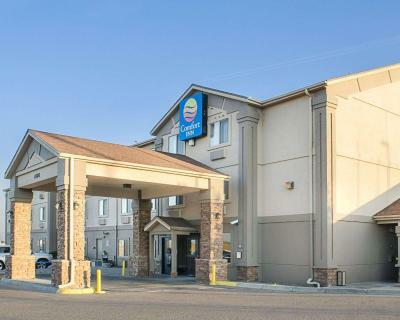 Comfort Inn Garden City This rating is a reflection of how the property compares to the industry standard when it comes to price, facilities and services available. It's based on a self-evaluation by the property. Use this rating to help choose your stay! 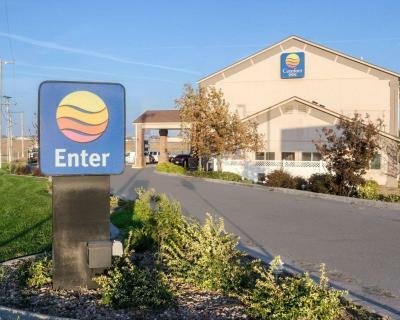 Comfort Inn hotel is located at the junction of US Highway 156 and US Highway 83. It is minutes from the 110-acre Finnup Park, the Lee Richardson Zoo, the Garden City Community College and Garden City Regional Airport. It is also closed to Buffalo Dunes Golf Course and Southwind Country Club. Many festivals and events are held throughout the year in Garden City, including the annual Southwest Kansas Pro-Am charity event, Beef Empire Rodeo, Tumbleweed Festival and Art-in-the-Park. Several museums, art galleries and historic landmarks nestled in the surrounding area. Additional area attractions worth a day trip include Lake Scott State Park and the Santa Fe Trail. The hotel also provides access to local softball fields, pheasant hunting and many more outdoor activities. Full-service features and amenities include free wired and wireless high-speed Internet access, free evening snack, lounge open every day offering cold beer and other spirits and daily drink specials. It is a 100 percent smoke-free hotel. Free hot breakfast is also provided. Guests can relax in the indoor heated pool and hot tub. There is also an on-site exercise room. Coin-operated laundry facilities are located on the property for guest convenience. This is a pet-friendly hotel and a stay fee applies. Business travelers will have access to copy and fax services and competitive corporate rates. Meeting facilities are available. When would you like to stay at Comfort Inn Garden City? Cable TV is included in this room, along with a microwave, fridge, and coffee-making facilities. House Rules Comfort Inn Garden City takes special requests – add in the next step! Comfort Inn Garden City accepts these cards and reserves the right to temporarily hold an amount prior to arrival. Water in the shower never got hot. A bag of trash was in the hall for over a day. Also had to go get toilet paper from the desk because noone ever checked the room and we were there from Wednesday night to sunday. Liked that the pool was 24 hours and that the hotel had ready access from the main road. Everything was nice neat clean staff was great. We had a room that joined the room next to ours. While we were not staying in 2 rooms, we would have preferred a none joining room. The people next to ours turned there tv on at 5am and woke us. The door was misaligned and there was definite separation between frame and door that would not prevent noises form coming in. Other than that it was decent. Small pool and 2 pieces of equipment (Bike & Treadmill) for fitness room. We didn't plan on using so did not care, but thought I would mention for those looking for these amenities. They charge to much the rooms were not cleaned good the tubs need work the pillows are really bad you need new ones. When we asked the maid to change the sheets on the bed she didn’t do it. Noisy, too many pets. Trash not cleaned up outside the hotel. Overflowing with trash. I hated the pillows. Breakfast was nice but not kept clean. Tableau were filthy. If staff stuck around and not hung put chatting then I would be satisfied. We booked on line at Booking . Com, booked a Two Queen size beds, but less the motel industry looks at bed differently we got full size beds that definitely need to be replaced. There were no towels in the pool area. Our toilet clogged every single time we’d flush. Every time the neighbors flushed their toilets, we could smell poop in our room from it. Pillows were way too small and beds were hard.